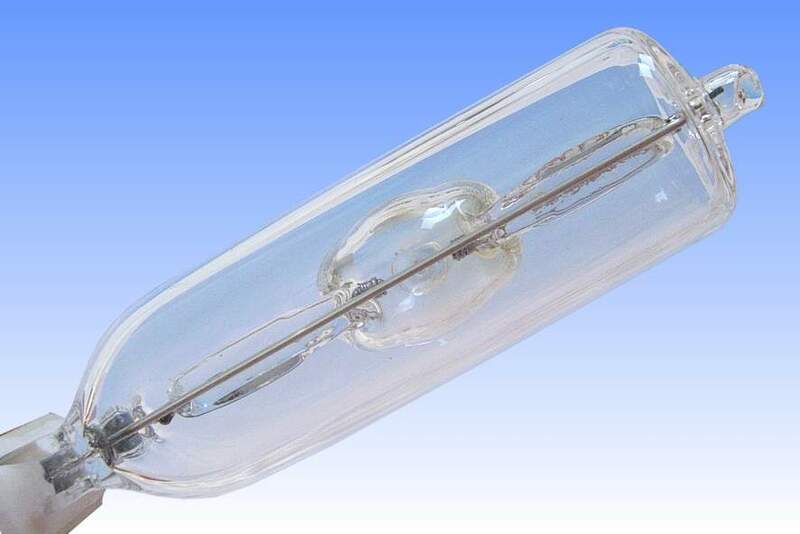 The Philips tin-halide short arc lamps were developed for the early 'video wall' projection applications in the 1980s, where a compact source having excellent colour rendering was required. The arctube is overdosed with tin chloride, and its discharge is unusual in that a substantial amount of the visible radiation is emitted by tin mono-halide molecules. 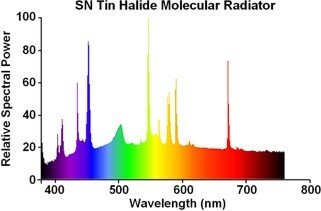 This so-called molecular radiation gives rise to a continuous spectrum with excellent colour rendering properties. A notable feature of the molecular discharge is its highly diffuse nature - other high pressure discharges tend to be far more constricted. Consequently the wall temperature is rather high and the arc tube is much larger than for similar wattages, and a gasfilled outer is necessary. The luminous flux and the colour temperature decrease very little over the life of this lamp, and colour remains constant when dimmed or over-driven. But unfortunately there proved to be a large lamp-to-lamp colour variation between SN lamps, which was a problem where many lamps were used in large videowalls. Development was suspended on the tin lamp and Philips focussed its efforts on the rare earth chemistries. This resulted in the development of the MSR series, largely based on dysprosium iodide. At such high loadings Dy, with small additions of alkali earths to control the colour point, also delivers exceptionally good colour rendering. Incidentally because the rare earth arc is more constricted, it was possible to employ exactly the same SN arc tubes, with only a change in chemistry to create much more powerful MSR versions. 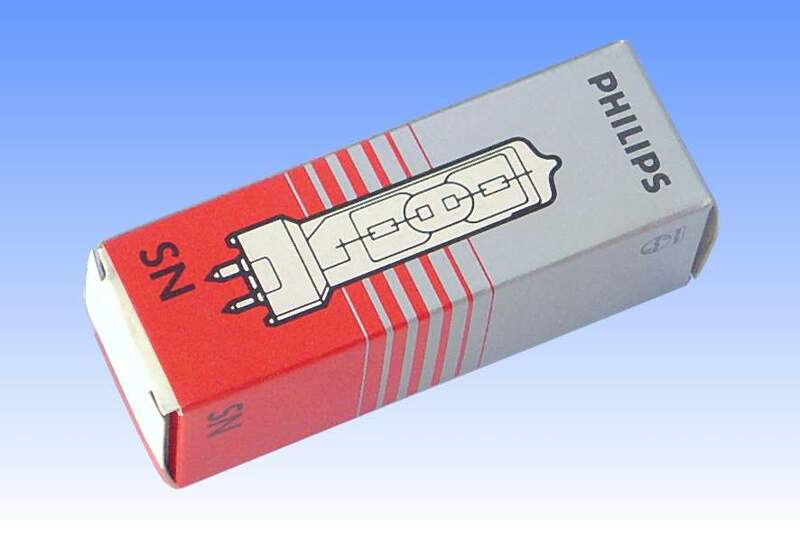 For instance, this 220W arc tube was employed without change in the MSR 575W product, and the SN 880W arc tube was employed in the future MSR 2500W. 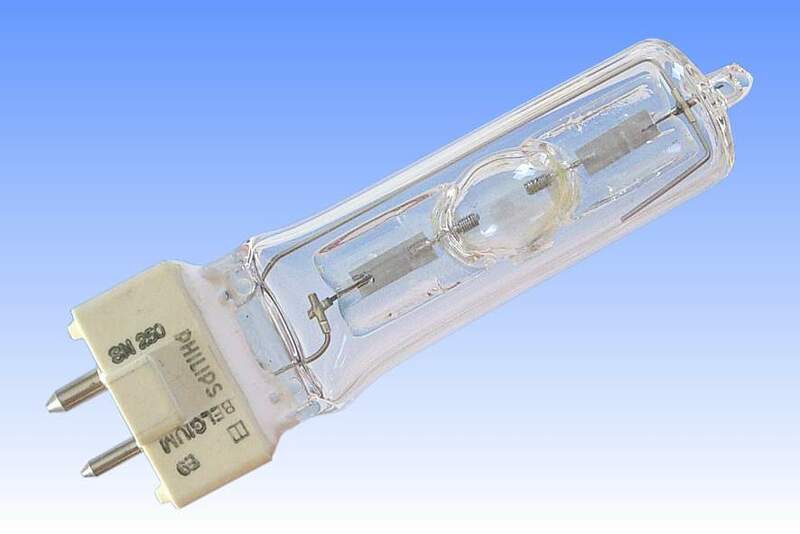 References: 1) Philips Data Sheet 'Tin-halide Short Arc Lamps' May 1987. 2) Philips Compact Lighting Catalogue, 1987/88. 3) Philips Deutschland Katalog Lampen/Batterien, 1990/91. 4) Private communication, Frans Verwimp (ex-Philips Turnhout), 2004.